Rajgira Sheera or Rajgira Halwa Recipe – A simple and easy sweet dish for Upvas/Vrat/Fasting days. There are many Upvas recipes made with Rajgira. 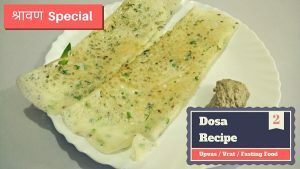 I’ve already shared more than 15 Fasting Food recipes on my YouTube Channel, from Farali Roti to Upvas Dosa. Here I’m sharing a dessert recipe you can eat during fasting days like holy month of Shravan or Navratri etc. Rajgira Sheera made from Rajgira Atta (Amaranth Flour), Milk & Sugar. This Halwa is flavoured with Cardamom Powder & garnished with Dry Fruits. Rajgira, also known as Amaranth is also a Gluten-Free grain. Therefore it’s a perfect dessert recipe if you are allergic to gluten. Roasting Rajgira flour in Ghee is a crucial step in making this Sheera. Check out the step-by-step recipe below and video tutorial. First of all heat milk in a pan on low flame until it starts boiling. Add Clarified Butter in another pan and heat over low to medium flame. When ghee is slightly hot, add Rajgira Flour, keep on stirring and roast for 5 – 7 minutes. Once the colour of flour changes to lightly brown, add raisins and roast for 1 minute. After 1 minute add hot milk and stir continuously, make sure there are no lumps. Add sugar, mix well and cook for more 2 minutes until it dissolves completely. Finally, add cardamom powder, grated dry fruits and mix well. Rajgira Sheera is ready to eat, switch off the gas. Garnish with dry fruits and serve hot.